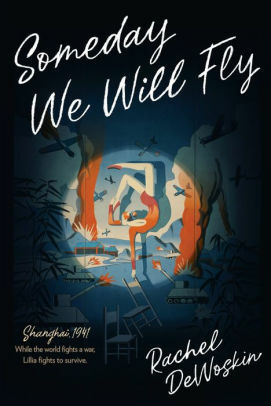 Someday We Will Fly explores a little-known chapter of the Holocaust: the Jewish refuge of Shanghai. May 18, 1930: Lillia Kaczka, her family were supposed to leave Warsaw together. But Mama was delayed. The family waited until they could wait no longer. The train was leaving, and if they missed the train they would miss the boat and if they missed the boat their chances of surviving as Jews in Poland were drastically reduced. So they went: 15-year-old Lillia, her baby sister Naomi, and their Papa, hoping Mama would somehow manage to meet them later in Shanghai—the only place in the world that accepted Jewish refugees. They arrive without a penny, find the Jewish colony, make connections and try to find work on pay that will barely keep them alive. “When I put the shred [of brisket] into my mouth, hunger and joy and the warmth of the fire that had roasted the meat came into my body . . . Food and hope were the same.” It’s a strange existence, all the more because the Japanese have taken over Shanghai and much of China. The invaders see the Jews as good luck—until Pearl Harbor seals their alliance with Germany. Then Jews aren’t so lucky. Worldview/moral value: 4Artistic value: 5The post Someday We Will Fly by Rachel DeWoskin appeared first on Redeemed Reader.